It's time for the big reveal! 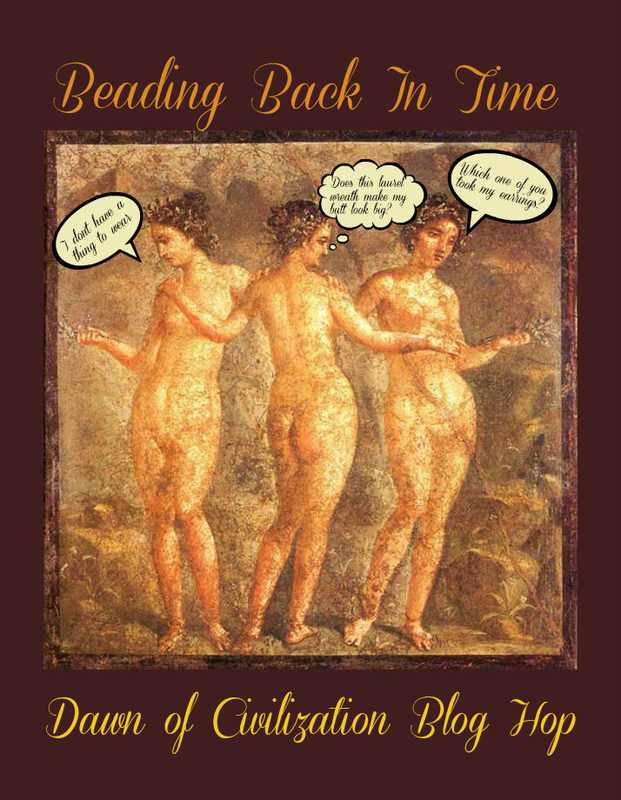 Earlier this month I posted about the third installment of the Beading Back in Time Blog Hop Challenge hosted by Lindsay Starr and I (it's here if you missed it). Our first installment in January focused on the time before humans and the second installment, on early humans. For this round, we drew inspiration from early civilizations. I really meant to explore something other than ancient Egypt, but I've been an Egyptophile since I was a kid and the temptation was just too strong. 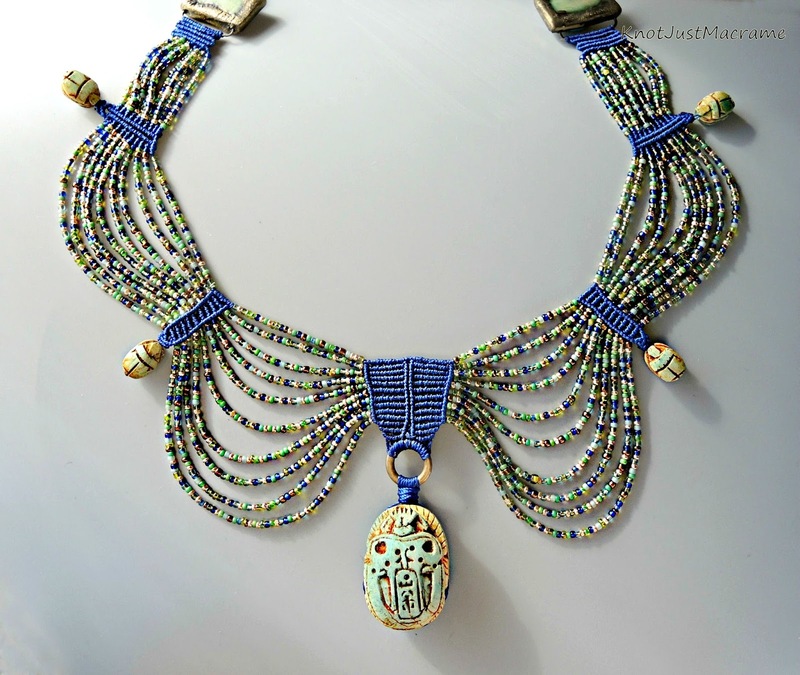 I have a seed bead mix called Egyptian Lapis Stripe. I dug it out and put it with some bright blue cord to start channeling some Egyptian vibes. It's pretty enough, but it really wasn't screaming "Egypt" to me, so I figured I'd better try a little harder. The first thing that comes to mind when I think of ancient Egyptian jewelry is a collar. And gold. I don't use a lot of gold, but I knew I wanted to add it in my piece somehow. I was also pretty set on the bright blue cord. When I was digging through my stash looking for stuff with Egyptian flair, I came across some end pieces by Scorched Earth. They're not exactly Egyptian, but I liked the feel of them. I also had an Eye of Horus pendant from Scorched Earth and a bunch of scarabs. The bead mix I had didn't quite match the end pieces (not enough green, too much orange), so I mixed my own. I also unearthed these gold pendants from a swap I did a while back with my friend, Lennis (she put together an awesome Egyptian inspired package for me you can see here). By this time, even though I'd had a whole month to make a piece for this hop, I'd wasted 91% of the allotted time. Typical. Apparently I work best under pressure. I hadn't counted on breaking a crown and having to have a tooth pulled, however. Note to self: start earlier! I did manage to pull off a piece just in the nick of time, though. 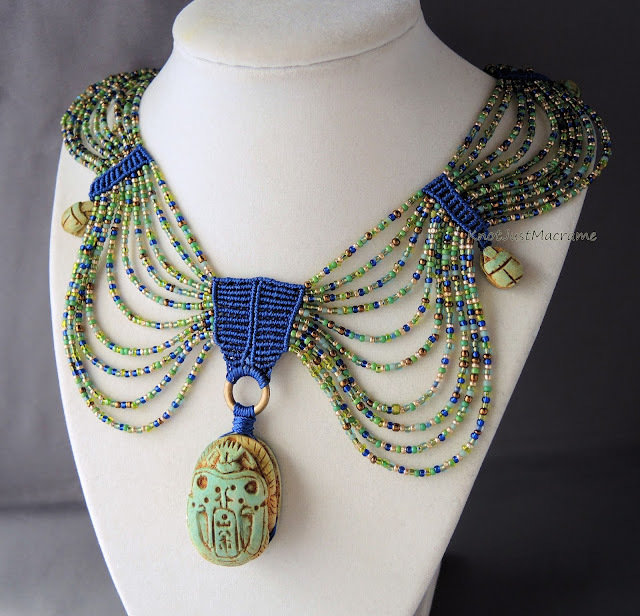 My Egyptian inspired collar, featuring Egyptian blue cord and a custom bead mix, several small scarabs and one larger focal scarab. It's a super cool scarab, too. I have no idea what the back says, but it's fun. My original plan was to use the Eye of Horus focal and my backup plan was to use one of the rectangular gold pieces. The shape of those just didn't work in the piece as well as the rounded shape of the scarab. I can picture this piece being worn by some Egyptian back in the day, can't you? I look at your work and think I have no talent what so ever. Stunning. I know exactly how you feel (I do that all the time). We should all be able to appreciate another's moment without having that take away from our own, don't you think? Let's work on that :) And thank you for the compliment!! Love it Sherri! I've got a pile of other Egyptian/Greek inspired things pulled too, but barely managed to get my one piece done. Such is the beady life, right? I was darned happy to get this finished in time. It was too close for comfort! This is striking. And to answer your last question first, YES! It's gorgeous. I want it. But then, I'm like a magpie with a very small nest to keep things in. Sherri, you never cease to amaze me. This is museum quality. Gorgeous. Thank you, Donna! It was fun. I'm not sure it's a very "wearable" design? But it's fun! Wow Sherri, this necklace is amazing! You always blow me away with your jewelry designs. I love everything about it!! This is one of my favorite pieces of yours now. Of course, there are so many you should make a calendar. Oh my, what an amazing piece!!! I love the colours you have chosen and it just looks... well words don't quiet cover how fantastic this one is! Your macrame as always is stunning and I love how the beads drape, just a stunning piece! Sherri, the necklace is gorgeous! Wonderful design! Wonderful looking necklace, very much Egyptian style. Honestly - Im glad you didn't go gold. Sure, its a material we all associate with Ancient Egypt... thats exactly why its nice to NOT go there. The multi strand collar style is SO spot on. Gorgeous.